The objective of this mini-series is to teach your dog a one minute sit. And is a progression of the third milestone: heel and sit. All these exercises are done in a quiet training area free from any distractions. At home in your garden is fine. Like ‘heel’, ’sit’ is a long duration behaviour. When you tell your dog to sit, you don’t want him to bounce his bottom on the ground and get straight up again. The sit always has some duration. [wp_ad_camp_1]But rather than keep refering to ‘the long duration sit’ we usually call it a ‘stay’. Some people use a command ‘stay’ but this really isn’t necessary. Sit, means ‘sit until I tell you to do something else’, there is no need to complicate things by adding extra cues. There are lots of ways to practice the long sit. In this series your dog will learn to remain seated whilst you walk all the way around him in a circle at a distance of 10 yards. He will also learn to sit still whilst you walk ten yards directly away from him, wait one minute, and then return. What about rewards? How should you reward the dog for getting it right? This will depend on your dog. Some dogs are thrilled to be praised and/or given a gentle stroke. Others would rather have a piece of cheese. Some will leap about and get excited if you praise too enthusiastically. Whatever rewards you choose, be generous at this early stage in training. Your dog needs to know he is getting it right. We’ll assume that up until now, you have asked your dog to ‘sit’ very briefly. You may even have asked him to sit, and then let him wander off when he got bored. From now on, we’ll have a new standard. Sit means ‘sit right there until I tell you to move’. It is better if you do not repeat the sit command. So if the dog gets up again, you can gently manipulate him back into a sit, or lure him back with a treat. There are two ways of releasing a dog from the sit. You can use a ‘release command’ or you can give another and different command. In this exercise, we are combining sit with some heelwork. So your dog must remain sitting until you ‘heel’ him away. Leaving the dog on a ‘sit/stay’ brings two new aspects, or factors of difficulty, to the sit. These factors are ‘time’ and ‘distance’. As with any new factor of difficulty these are best introduced separately and gradually. When you walk 20 yards from a seated dog not only is the distance you travel a factor but the time it takes you is a factor too. With the dog on a lead at heel walk a few paces and ask him to ’sit’ as usual. Heel the dog on a few steps, and repeat, four or five times. Now try a five second sit, praise, pause…and heel the dog on. Repeat, but don’t go to more than ten seconds in the first session. Mix in some short (two seconds or so) sits with the longer ones. Keep the session short (5 minutes or so) fit in lots of repetitions. Finish with an easy one. This is deliberately very easy, to give you a starting point where the dog is unlikely to fail. Most dogs will manage a three second sit like this and progress to a five to ten second sit within a couple of sessions. Some dogs may need a little longer. If the dog gets up before your ‘heel’ command, do not repeat the sit command. Reseat him and finish the lesson with a couple of very brief sits so that you end the session with success. Make a mental note to go more slowly next time. Some dogs need a great many more repetitions than others. If you are getting more than one or two mistakes in any one session, this suggests that you are adding too much duration, too quickly. Over the course of a few sessions gradually work your way up to a 20 second sit at your side. Remember to vary the sits within the session. It is tempting and a common mistake to keep making the lesson progressively harder until the dog makes a mistake. All this teaches him is that he is bound to mess up at some point. Sandwich the hardest longest sit away in the middle of the session. 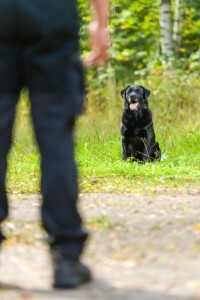 (Checkout: using sandwiches in dog training) Then if he makes a mistake, he won’t remember it. And move on to Part Two when your dog can remain seated at heel, reliably for 20 seconds without any input from you, apart from you single sit command.